Are you preparing for Cataract Surgery? A cataract is an eye disease in which the normally clear lens of the eye becomes cloudy or opaque, causing a decrease in vision. Cataracts are usually a very gradual process of normal aging but can occasionally develop rapidly. They commonly affect both eyes, but can be asymmetrical. Consult our eye surgeon for Cataract Surgery in Glasgow. Cataracts are very common, especially among the elderly. Rarely, cataracts can present at birth or in early childhood as a result of hereditary enzyme defects, other genetic disease, or systemic congenital infections. Severe trauma to the eye, eye surgery, or intraocular inflammation can also cause cataracts to develop more rapidly. Ensure that your Diabetes is well-controlled. Follow your doctor’s advice on diet, exercise and medications to control your blood sugar levels. Wear Sunglasses, Ultraviolet light from the sun may contribute to the development of cataracts. 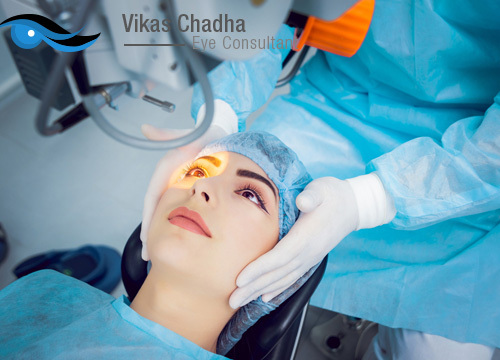 Mr Vikas Chadha has been a Consultant in the West of Scotland since 2009 and is now a Consultant Ophthalmic Surgeon at the Tennent Institute of Ophthalmology at Gartnavel General Hospital. He is an experienced cataract surgeon having performed many thousands of cataract surgeries. He rigorously audits his results and has found his success rate well above the UK national standards with an overall complication rate of less than 1 percent. He also specialises in Eyelid Surgery, Lacrimal Surgery, Orbital Surgery and Ocular Oncology.